You will learn how to make your own LinkedIn clone on Android, using React Native, React Navigation, Redux and Backendless. By following the instructions in these articles, you’ll get the knowledge and skills required to build simple Android apps using Backendless mBaaS for your business logic. You will learn about the tools required for the task and how to set up the development environment to proceed. You will do your first steps to get some basic functions for your app. You will get familiar with Backendless and start building the server side logic for your app. You will finalize the visual part of your app and will get a functional Linkedin clone. 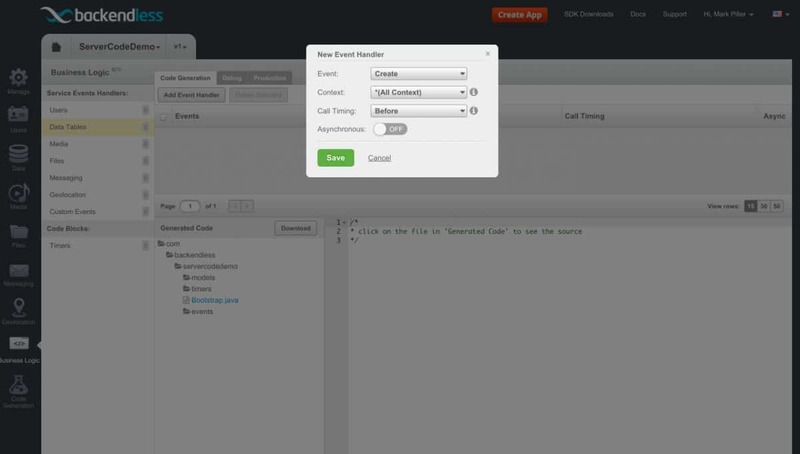 The custom business logic feature in Backendless lets you add your own server-side code to handle client API requests. In this post I am going to review how to add the Data Service API handlers. With that type of handler you can intercept and add additional logic for the APIs which store data in Backendless, run queries, update or delete data objects. Previously I wrote how to generate custom business logic code for API event handlers and how to locally debug your custom code. Now your code is ready to be pushed to the Backendless servers. Once it is out there, the Backendless infrastructure automatically handles scaling the code execution and routing requests to an instance available to run your code. The process for deploying an API event handler is very similar to the one for timers (see deploying custom business logic in timers to Backendless). Previously I described how to use the Backendless Console to generate custom business logic code. In this post I will describe one of the most amazing features in Backendless – an ability to debug custom server-side code on the developer computer before deploying it to the cloud. It would be very helpful for you to go through the previous feature to establish the surrounding context. In my previous post I introduced the feature of server-side API event handlers – a mechanism for injecting custom business logic into Backendless. In this post I am going to review the process of creating an event handler for User Service APIs using Backendless console. The User Service APIs include: user registration, login, logout, user update, password recovery and retrieval of user schema (a list of user properties and their types). You can build an event handler (or two event handlers – “before” and “after”) for each of these operations.